You are viewing Day 1. Here is Day 2, Day 3, Day 4, and Day 5. 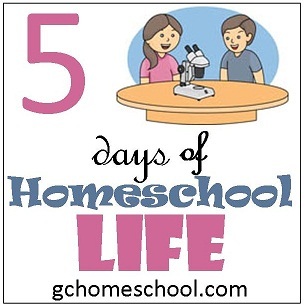 I chose the general topic of Homeschool Life because I always love peaking into other homeschool lives! So, here is a peak at one of our days. It all starts on Saturday. Yep, that's right - Saturday! Saturday is my day for planning my week and if i don't get this done (which happens more than I like), I feel totally lost and floundering for the whole week. So, after soccer and lately dance practice, I spend Saturday afternoon planning. 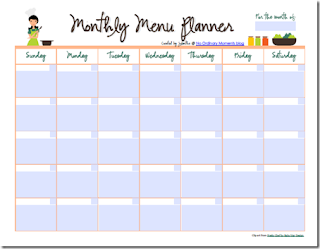 Weekly Lesson Plan Excel - I actually use this along side our My Father's World planner. I didn't see the need to type all that over again so I just use both. This one I can add our review items in too. Feel free to download and edit it to fit your family. I just fill it out week by week. I like to hang this on the fridge to solve the what's for dinner question. The last thing to get ready is the school checklist for each child - they love checking off accomplishments as much as their mom. :) Not sure why it is showing up on 2 pages - if you download it, it is only 1. Each child's list looks exactly like this one so they each have a template and I just fill out the details each week. Again, feel free to download by clicking on the link. I also take out my Well Planned Day (affiliate link) calendar and look over what events we have coming up for the week. As soon as I receive dance schedules, church schedules, sports schedules, invitations, etc, I immediately write those events in my calendar and file the papers in the back until the events have passed. I usually clean that out once a month. My Saturday planning session usually takes about an hour to complete. Sometimes, it is longer if I want to read ahead or especially when we receive new review items. Starting my week off with this planning session sets the tone for the rest of the week for me! Do you have a set time to plan your week? Do you have any tips to share? Be sure to click below to see what my fellow crewmates are blogging about! Tomorrow, I'll share "my brain" and what a typical morning looks like around here right now. If you have something in particular that you would like me to include, let me know! Menu planning is something I have yet to do, that I really need to do! Great post! Thanks for sharing. I love your lists. Melissa, these links are helpful. My family has been discussing how to make meal planning for my grandparents easier and Jolanthe's form looks just right. We use MFW, too, and I tried your first link, but it told me "access denied." Thank you so much for letting me know about the link, Jennifer! I think it should be working correctly now. I had it marked as private - oops! Let me know if you have any problems!